I have a number of close friends, a lot of friends and a much larger pool of acquaintances. This page is dedicated to my friends. Unfortunately I can introduce less than half of my friends here as I have very few pictures with me. That's because I have a bad habit of not taking a camera with me to interesting places/events and also I was stupid enough not bring most of my pictures from Yerevan. Anyway. I apologize to those of my friends who won't be represented on this site. Here come the friends of mine whose pictures I happen to have with me in a somewhat chronological order that I met them. 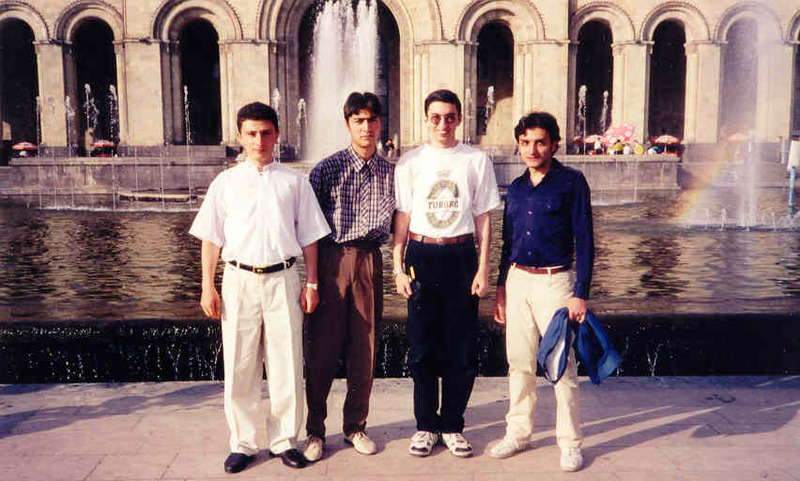 Here is a picture of my friends from Fizmat taken in the summer of 1999 in Republic Square of Yerevan, on the eve of my departure from Armenia. Even though we keep close contacts, I haven't seen them since 1999, but I hope I'll see them soon. 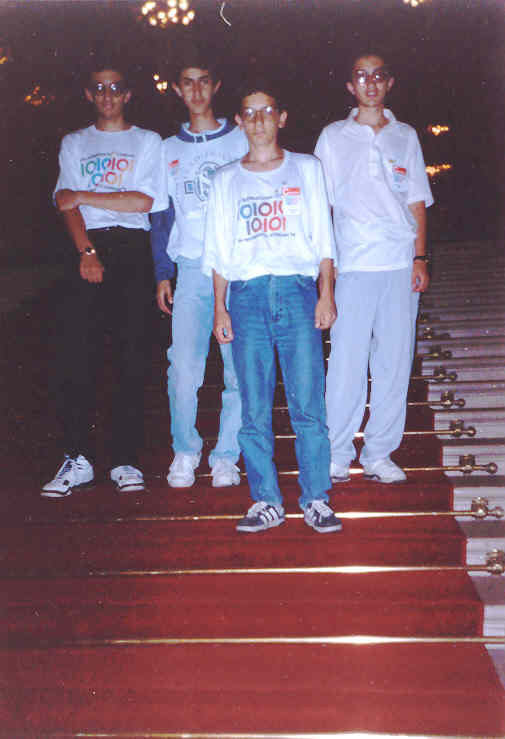 From left to right - Murad, Hayk, me and Vardan. 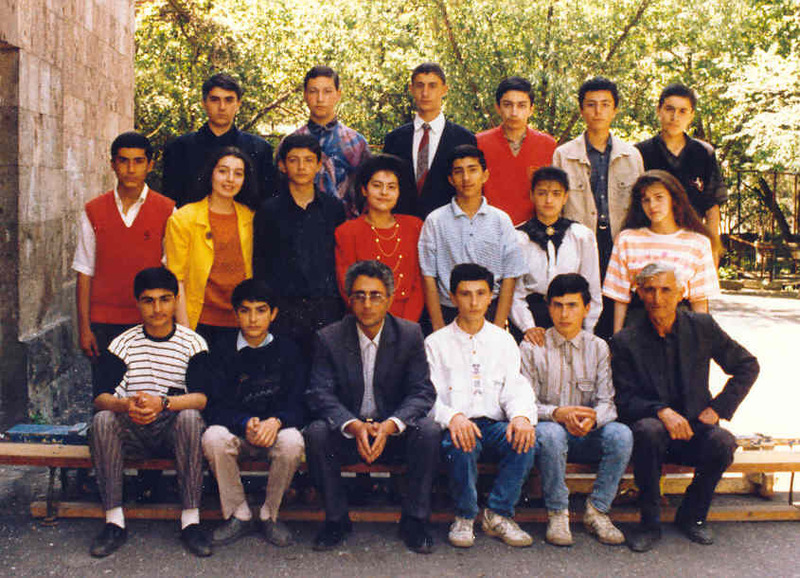 All three of them are currently in Yerevan doing their Ph.D. degrees - Murad in Computer Science, Vardan and Hayk in Physics. 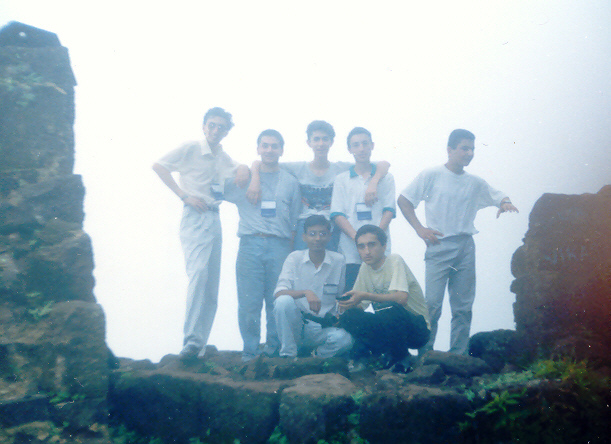 This picture of Armenian National Math team was taken in the mountains of India where we were participating in the International Math Olympaid. Top Raw: me, Arman (currently studying math at Yerevan State University), Sahak (doing his physics Ph.D. at Cornell), Hayk (working as a software developer in Yerevan) and Grigor (he tragically drowned in Lake Sevan). Bottom raw: Amul (our Indian guide) and Khachatur (currently doing his math Ph.D. at the University of Michigan). This is the Armenian olympiad team (computer science). From left to right - me, Sahak, Vahagn (doing his graduate studies at Yerevan State University) and my brother Ara. This picture was taken in the Hungarian Parliament (Budapest), the most beautiful and impressive building that I've ever seen. I have many friends from Yerevan State University and I spent many hours with them studying, partying and just hanging out in the cafes near our University. Unfortunately I don't have a picture of them with me, but I hope they will send me some pictures so I can post them here. Another big group of friends that I'll have to skip here are my Houston friends. I have a lot of friends in Houston especially among graduate students who study at the University of Houston. Unfortunately I don't see them frequently, although I visit them every time I go to Houston. I hope I'll be able to post some of their pictures soon. From left to right - Konstantin, Vrushali, Jelena and me. We (this group and others) spent almost every weekend and some of the weekdays hiking the mountains of Los Alamos, going to movies, restaurants and operas in Santa Fe and gambling in a casino close to Santa Fe. It was quite an interesting summer. I have some new friends in Boston and I hope I'll be able to post their pictures quite soon.